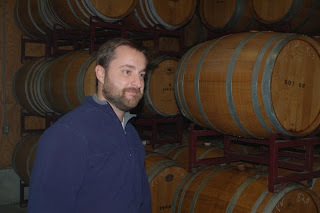 Wine Dogs and other Virginia wine afficionados know Jason Burrus as the skillful winemaker at Rappahannock Cellars. 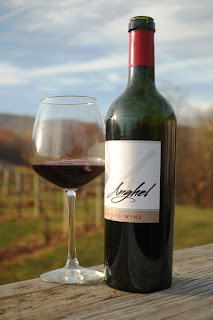 Recently, however, Jason has branched out, launching his own label -- Anghel Wine. 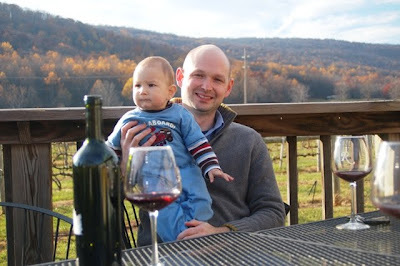 Munchkin and Pomeroy joined a small group of Wine Club members for a special sampling of Anghel's first offering - the 2008 Virginia Red Table Wine - last month. 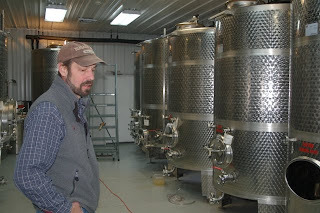 Jason's stated goal is to produce small lot artisenal wines from Virginia's finest vineyards. In this case, he chose Petit Verdot and Cab Franc grapes from Two Principals Vineyard near Marshall and Willowcroft Winery in Loudoun County, respectively. The wine spent 18 months in oak before bottling in May. The result is a full-bodied Bordeaux-style wine that exhibits the distinictive cherry and pepper flavors of the best Virginia Cab Francs, with the PV adding a silky richness. 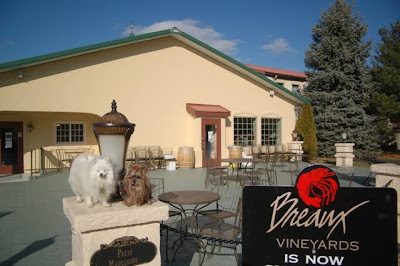 Both Wine Dogs give Anghel an enthusiastic four paws up! Anghel is Russian for angel and is the maiden name of Jason's wife, Natalia. 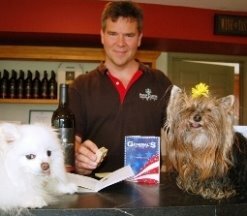 The Wine Dogs were also introduced to the other little Burrus 's anghel, son Maximilian (9 months in barrel), who helped inspire the wine. 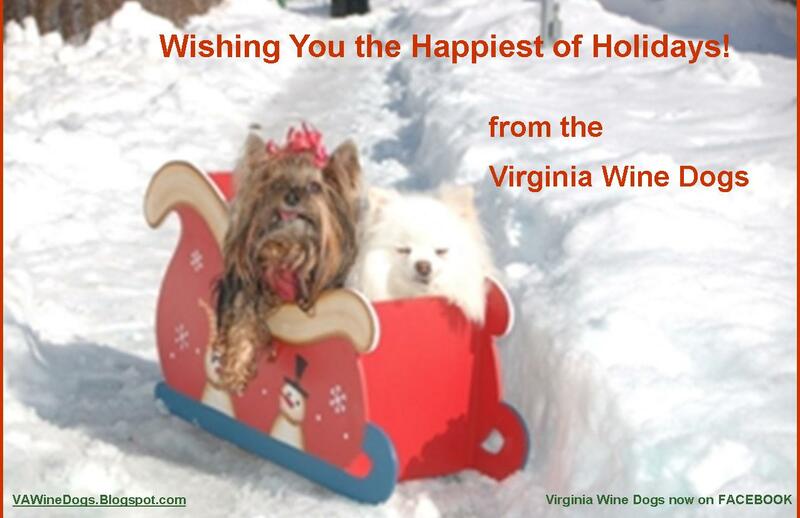 Wine Dogs Wonder: Ho, Ho, Ho, Who Wouldn't Breaux? 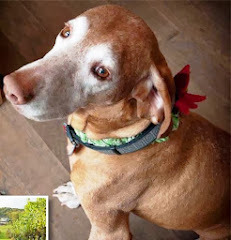 It was Wine Dogs to the rescue when winemaker Dave Collins sent out the call for bottling help. 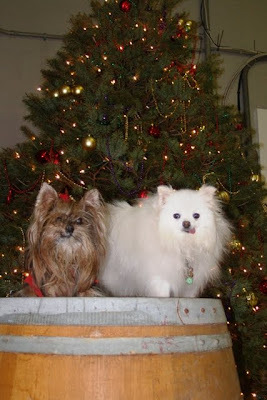 Munchkin and Pomeroy high-tailed it out to Breaux Vineyards for a long-overdue visit to the winery that has been voted Virginia's favorite for two years running. Started by Paul and Alexis Breaux in 1994, the popular winery now has over 1,000 members in its wine club. With 104 acres of grapes producing 10,000 cases a year, Breaux maintains its own bottling ro om (many other wineries use mobile bottlers). Bottles are placed on the mechanized assembly line and sent into the bottling room where they are automatically washed, sanitized, dried, filled, corked and labeled. 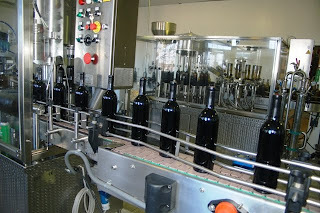 The completed bottles come out the other end, where they are manually placed into cases, which must be closed and placed on the palates. 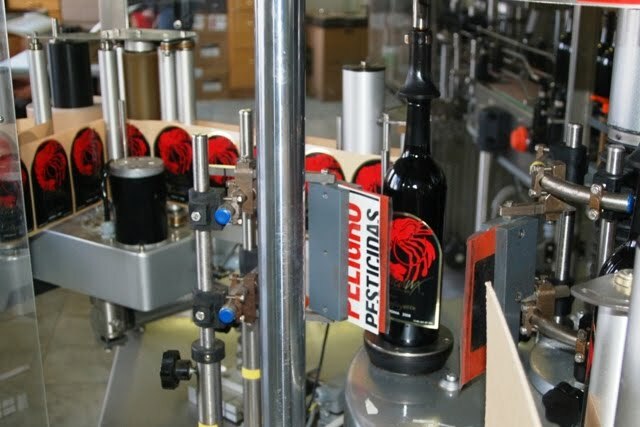 The immediate task was getting the 2008 Lafayette Cab Franc into bottles – 7,200 of them. 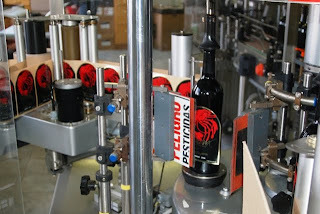 The line to the machinery was connected to the tank holding the wine. 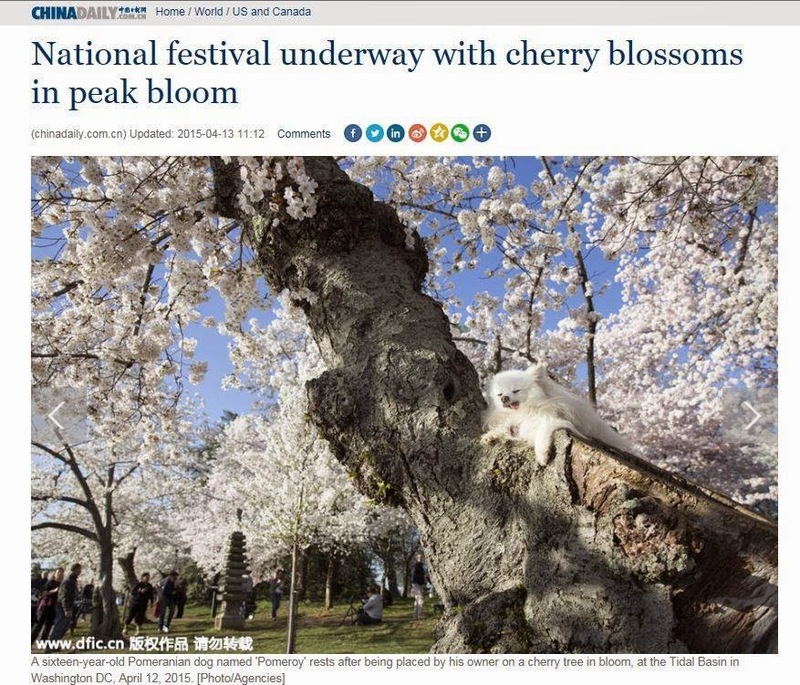 As things cranked up, the bottles started pouring out at a furious pace and the Wine Dogs were called onlto the line to lend a helping paw. During a lull in the process for quality control (the labels require precision setting), Dave took the Munchkin and Pomeroy back for a tour of the barrel room. 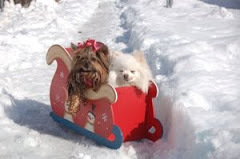 They were met by Breaux General Manager Chris Blosser. 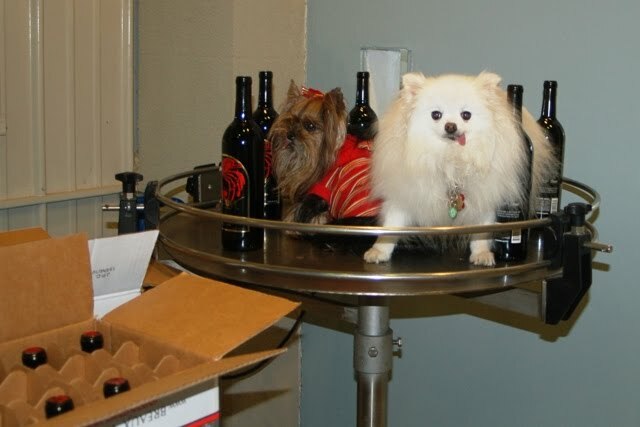 As thanks for their assistance, the Wine Dogs were treated to a tasting. 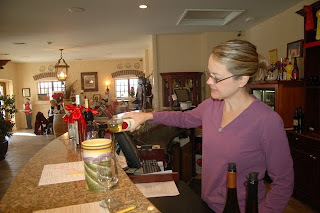 Even on a wintry Thursday afternoon, the tasting room was a hub of activity. Wine Educator Kathy led Munchkin and Pomeroy through a flight of 10 Breaux wines – three dry whites, five reds, and two sweet wines. 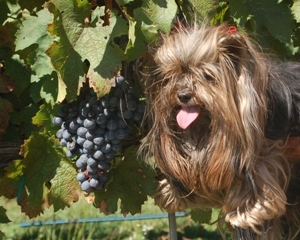 The whites were friendly and approachable, but with the cooler weather, the Wine Dogs’ fancy turned to reds. 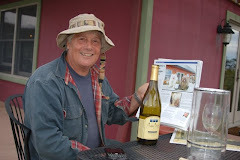 The selection was outstanding, beginning with the Equation – a blend of 2007 grapes which had excellent finish and rich mouth feel, a great buy at $15/bottle. After spending the morning bottling the 2008 Cab Franc, the Wine Dogs were eager to check out the earlier vintage in the tasting room. 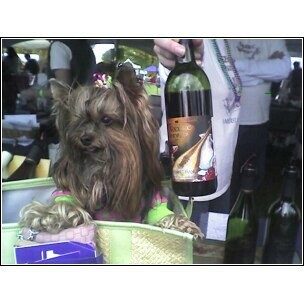 The 2006 Mar quis de Lafayette pleased their puppy palates with hints of the coffee and chocolate/cherry. 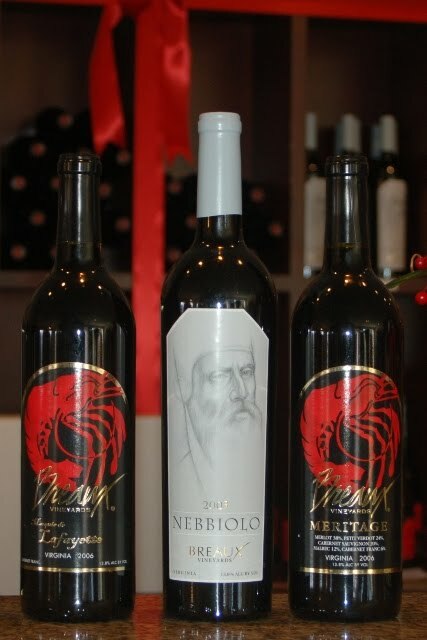 Breaux’s 2006 Meritage was another winner. Based on this tasting and wines recently sampled from Pomeroy’s cellar, Virginia’s 2006 reds appear to be coming of age and are drinking beautifully. With a little more time in the bottle, the 2004 Merlot has had the chance to fully integrate, producing a silky wine with a subtle oak finish. The stand-out was the 2005 Nebbiolo, an Italian grape with that produces a rich, sultry wine. 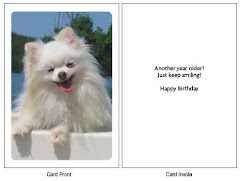 As a terrier, Munchkin appreciated the earthy flavors of leather and tobacco and detected a raspberry nose. 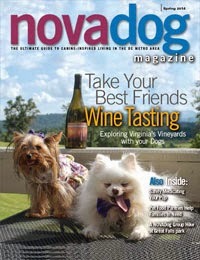 The Wine Dogs took home left a bottle of Breaux’s 07 Reserve Cab Franc to sample during the Virginia Wine Blogger’s virtual wine tasting. While Dave says he loves all his wine "children," he told the Wine Dogs the Cab Franc Reserve a very special wine. After tasting it on Thursday night (it pairs perfectly with tenderloin), Munchkin and Pomeroy agree with an enthusiastic four paws up. 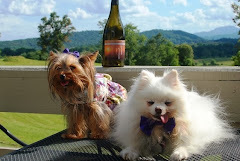 The Wine Dogs are still savoring the taste and looking forward to their next visit to Breaux.